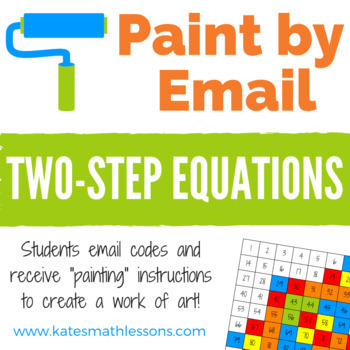 Looking for a fun way to help your math students practice solving two-step equations? In this activity, students solve 15 equations to create 5 different codes. 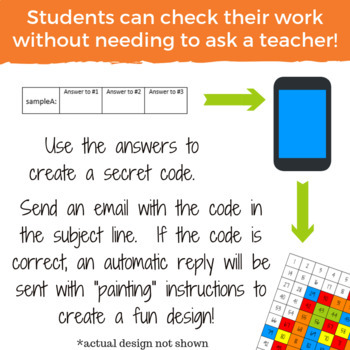 They email the codes and will receive "painting" instructions if their codes are correct. 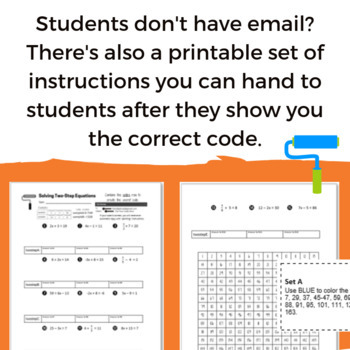 It's an easy way for students to check their answers without asking a teacher! The students will use the directions from the automatic replies to create a colorful design on the back side of the worksheet. Equations include combinations of multiplication, division, addition, and subtraction. Solutions include positive and negative integers. Your students will need blue, green, red, yellow, and orange crayons, markers, or colored pencils to complete the work of art (I wouldn't recommend actual paint unless you're feeling extra brave! ).